Following the six posters released way back in November, a new full-length trailer has been released for Attack on Titan. This live action adaptation of Hajime Isayama's 2009 manga is actually the first of two movies, with Attack on Titan set for release on August 1 in Japan, with the second movie, Attack on Titan End of the World debuting September 19 in Japan. Unfortunately, it hasn't been revealed when these movies may be released in the U.S. at this time. The story is set in a world where all of humanity must live behind massive walls, to protect themselves from gigantic humanoid creatures known as the Titans. 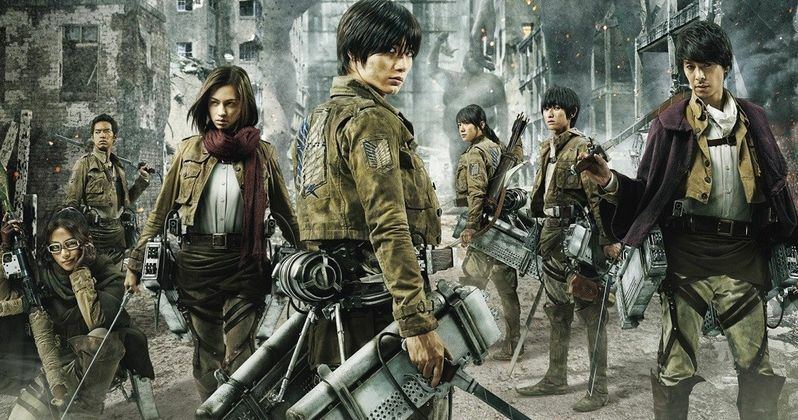 Haruma Miura stars as Eren Yeager, who, along with his adoptive sister Misaka Ackerman (Kiko Mizuhara) and their friend Armin Arlert (Kanata Hongô), join the elite fighting unit known as the Survey Corps to battle the Titans, after Eren's mother passes away following a Titan breaching the walls. The supporting cast is rounded out by Kanata Hongô, Satomi Ishihara, Nanami Sakuraba, Takahiro Miura, Ayame Misaki, Pierre Taki and Jun Kunimura round out the supporting cast. In addition to the trailer, we also have three more posters for this action-packed adventure, directed by Shinji Higuchi (The Last Princess). We'll keep you posted on the impending U.S. release of Attack on Titan, but, for now, take a look at the trailer and posters below.